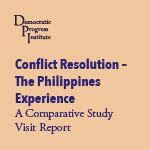 This report documents the discussions carried out during DPI’s Comparative Study Visit to the Philippines from 20-27 June 2015. The Southern Philippines peace process was explored in a series of roundtables held in Manila and Cotabato (Southern Philippines), and the visit included 18 participants from Turkey, including Members of Parliament from each main political party; policy makers; renowned journalists and media personalities; senior academics and members of Turkey’s Wise Persons Committee. The report details the meetings that took place between participants and key actors from the Philippines process including government actors and representatives of governmental bodies including the Office of the Presidential Advisor on the Peace Process; the Governor of Bangsamoro and the Bangsamoro Transition Committee; Moro Islamic Liberation Front leader and critical actors in the process; Philippines Army military leaders; peace talks negotiators; high level journalists and media personalities reporting on the process; the International Monitoring Team and International Contact Group among others.